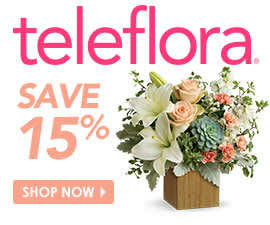 Love the smell of your Teleflora bouquet? You don’t have to give it up when your flowers wilt. Dry the petals, and add them to a homemade potpourri recipe. Mix them with barks, spices and dried fruits to make a fragrant decoration for your home. Consider what scents would pair best with your flowers and play around with a few different combinations. Also think about the colors you use in your potpourri mix. For instance, if you use the flowers from Teleflora’s A Little Pink Me Up arrangement, you can add dried strawberries to continue the color theme. Pressed flowers can be used for a variety of things, such as craft projects or art for your home. The technique also preserves their beauty so you can enjoy them years down the road. For starters, choose flowers from your bouquet that aren’t yet brown – this might mean disassembling the arrangement earlier than you normally would, but fresher flowers create a better pressed product. Additionally, avoid misting your blooms before pressing because added moisture can cause browning. To actually press your flowers, get sheets of newsprint, blotting paper or tissue paper. Then, put the flowers (stems removed) between the pages. You can flatten your flowers using a press designed for the job or a book. Put the blooms (and the paper) in your book, then stack heavy objects on top of it. You’ll need to leave your flowers for three to five days so they can dry and flatten. Flowers, like other plants, are packed with nutrients that can be beneficial for your body. One of the most popular flavored waters is rose water, which has been touted for it’s ability to soothe, hydrate and revitalize your skin. It’ll even soften your hair! So save your rose bouquets for later use and learn how to make rose water at home. This is only one example of a flower water hydrosol that you can make yourself. Since you’re using this to improve your beauty routine, make sure your flowers don’t contain any pesticides, as these chemicals can actually harm your skin. Check with the florist to see if they use any chemicals and lightly rinse off your flowers before you start the process. Do you compost at home either to reduce your waste or to supply rich fertilizer for your garden? If so, then don’t throw wilted flowers in the trash. They’re organic compounds that contain nutrients, so they’re ideal for composting. Even if you’re preserving the petals, you can put the rest of the plant in the compost – that way, you won’t be wasting any of your bouquet. You can continue enjoying your flowers long after your bouquet has died. Try a few of these ideas and see which one you like best!